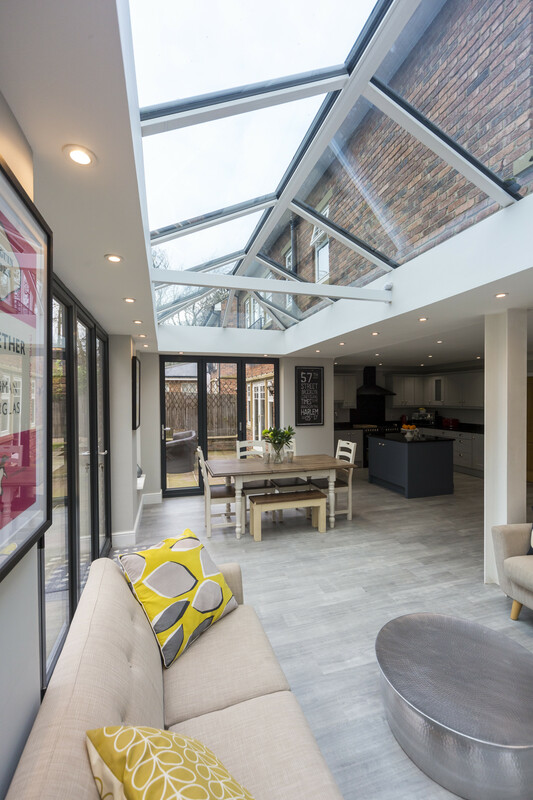 The King family were keen to add a large, contemporary glass roof to their extension and after visiting the Niddal showroom and seeing the Ultraframe Ultrasky roof with its sleek lines, they knew that this was the roofing system for them. The team at Niddal designed a spectacular Orangery extension that is over 6.5m wide, featuring an anthracite grey Ultrasky roof and several sets of bi-fold doors. As Ultrasky is the strongest glazed roof on the market, large spans like this can be designed with total confidence – especially as each roof is specifically engineered for its exact location using the postcode to calculate wind and snow loads. A 2-tier flat Cornice adds a further contemporary detail and exterior lighting has been added which shows off the extension to stunning effect in the evenings.